Six months ago, our case study covered the story of an award-winning Sheraton property’s decision to rework their hiring process and include the use of the Step One Survey II as an integral part of their prehire screening. In their first six months of use, the property cut their 30-day and 60-day new hire failure rates by about 33 percent, to levels of 14 percent and 18 percent respectively. Now, they have a full year of experience in using the assessment program and the statistics are even more impressive as shown in the graph. From their baseline 30-day rate of 22 percent, they have reduced 30-day failures to just 6 percent! The decline in the 60-day rate is as impressive, from 28 percent to 11 percent! 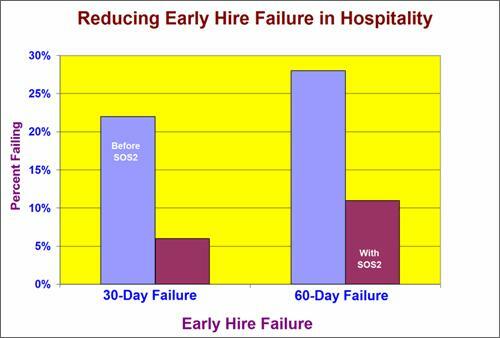 In the hospitality industry, early hire failure makes up the biggest part of total annual turnover, and also the most expensive part. Consider the expense of recruiting, hiring, training and losing employees before they ever really become productive. In this operation, hiring around 90 new employees in a year, this means a decrease of 25 new hires. A very conservative estimate of $2,500 per failed new hire shows the program is saving them $62,000 per year! The entire year’s expense for the program was $7,650, so they are enjoying a return on investment of over eight dollars for every dollar invested. Over time, the return has increased. It is expected to continue increasing into the second year of this simple and effective program.